Undoubtedly WhatsApp is most preferred text chat application over the globe at present scenario. It has become like an integral parts of the daily activities. However, it’s a fact that the application is not absolutely free like other options. Now it’s quite natural for you to look for similar options those can be there for you without any cost. These match pretty much with the standard as of WhatsApp as well. Have a look! WeChat is certainly the best replacement for WhatsApp. It is a big hit since the day of arrival. At present it has turned out to be biggest competitor for WhatsApp in present scenario. Credit goes to their excellent spec that is pretty same as of its competitors. There are features like text shares, picture share, and others. Distinguishing part is the Video Call that you can facilitates through the application. Initiating with it is damn easy. You just need to provide the Phone number and you get a verification text. Once you get the code you can easily get linked with your friends and others through it. In short, it matches perfectly with your expectations. Above all, this is absolutely free for the users and user-friendly. No need to worry about the mobile service provider when there is an application like this. It has made a huge rave by making your calls free of cost through the android devices. That’s not the only thing; it allows you to make free texts as well to your friends. The best part here is that both call and messaging is absolutely free for you. Just make sure there are an efficient internet connection and the android device. You don’t need to get worried in any way when there is an application like this with your system that reduces distinct applications on this regard. This is at the peak of popularity. It has turned out to be quite an official option these days. Its conventional use is quite known to all. However, apart from calling friends for free the application lets connect with the friends through texts as well. It is here to mention that its contacts have been blended along MSN or Hotmail contacts so that you can get connected with some old buddies. LINE is another fine option for those who are looking for something similar and as efficient as of WhatsApp. The application offers plethora of specs like infinite texts, audio texts and infinite voice call facility as well. The best part is that all these are absolutely free of cost. Its success can be well imagined through the record number of downloads of the application from Play Store. You can answer through PCs also upon the application being installed over it. The Samsung users are fortunate enough to have it built-in. Anyway, other users can have it through download as well. 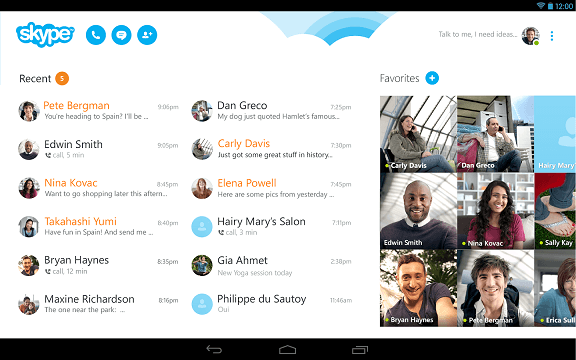 It has gathered huge popularity as a messaging application, despite having no call features. You just need to have signed in through a Samsung account, or by entering the name and mobile number verified. Author: Evelyn is a technical graduate. She has good knowledge of gadgets and technology. She loves to play with gadgets. You can find her sharing at essaypro.com.